To different people, food can mean many things. It can be a source of joy, a requisite for getting through the day, or anything in between. For Daphne Cheng—the founder of NYC vegan supper club Suite ThreeOhSix and a caterer for the likes of Vera Wang and Alec Baldwin—vegetables were her medicine. 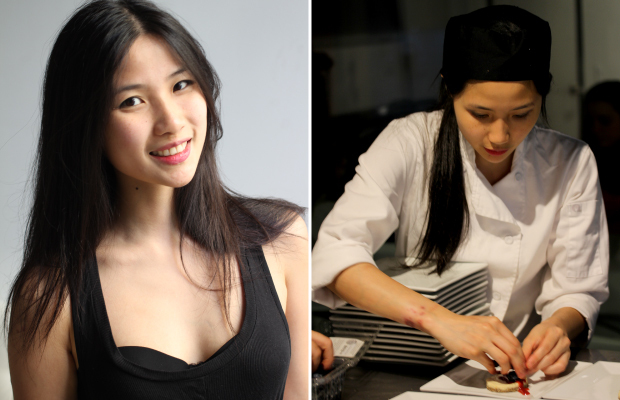 It was during her teenage years that the 24-year-old chef rekindled her love for food. She discovered veganism, in fact, in her recovery from anorexia. “I found that I really enjoyed the process of cooking. Playing with food, feeling it in my hands, and really becoming immersed in it was therapeutic for me,” she says. Her intimate supper club gatherings are held in a high-ceilinged loft in the trendy neighborhood of Tribeca, where one- to two-dozen eager gourmands sit flanked by a row of white Roman columns. Cheng bustles around a glass-walled kitchen right beyond the table, whipping up five- to eight-course meals and occasionally inviting beloved local guest chefs and bartenders to headline the night. The airy space has become a spirited platform for an unprecedented veggie revolution, with the culinary curious as its insurgents. Bell pepper bisque featuring Thai basil pesto and sunflower sprouts, and lemon sweet pea ice cream with rose sake mousse and cookie crumbs are just some of the creations that the patrons are eager to try—though, to further encourage an open mind, the menus are always a surprise. Of course, Cheng’s taste wasn’t always so sophisticated and inspired. “Growing up I had a lot of soda. We packed chips and Lunchables [for school], and I ate straight butter,” the chef admits. Neither was a career in food top of mind, though she did study the related field of nutritional sciences at the UC Berkeley. It wasn’t until she realized that she was barely going to class and recognized that her collegiate life wasn’t what she wanted that she dropped out for a soul-searching year before taking the leap to culinary school. Like many other entrepreneurs, much about running her own business thrills Cheng. “I love being able to dictate my own hours, following my own creative vision, and having the final say other aspects of the business—chefs don’t always have full control over what goes on the menu if they’re not also the restaurant owner,” she says. For the past six months, Suite ThreeOhSix has in part been a test run for the restaurant she opens to open next year. If passion, innovation, and an admirable groundedness are the keys to making that happen, we plan to be one of the first in line. Photos courtesy of Daphne Cheng.